Among the treasures of the Jewish people are folktales – told and retold for hundreds of years across the different continents where Jews have wandered. The tales are for all ages, but children’s authors have adapted many into captivating picture books. Our library is lucky to have a large children’s folklore collection – perfect for entertaining (and enriching) children and grandchildren this summer. Here is a sampling (in alphabetical order by author). A Big Quiet House by Heather Forest. An unhappy man complains to the village wise woman that he gets no peace at home – his house is small and his family is noisy. The old woman advises bringing a chicken into the house. Not surprisingly, the squawking chicken makes home life even more chaotic. Confused, but trusting, the man faithfully follows the woman’s further instructions to herd a goat, horse, cow, and sheep into the crowded house. After reading the satisfying denouement, kids may enjoy comparing this story to other versions, including Could Anything Be Worse? by Marilyn Hirsch, The Little, Little House by Jessica Souhami, and It Could Always Be Worse by Margot Zemach. What His Father Did by Jacqueline Dembar Greene. Herschel must travel from his home in Minsk to visit his elderly aunt in Pinsk. But how can he afford to travel all the way from Minsk to Pinsk with just one kopek in his pocket? Stopping halfway at an inn (located in Linsk, naturally), Herschel pays down his one kopek for a place to sleep and then begins bargaining for a meal, ominously threatening to “do what his father did” if no meal appears. The nervous innkeeper runs all over town, putting together a feast for Herschel. After Hershel is well fed, he finally reveals what his father did. Joha Makes A Wish by Eric Kimmel. Joha finds a magic wishing stick, but until he learns how to use it, his wishes go awry, causing trouble and even peril. One well-intentioned wish puts an enormous wart on the sultan’s nose, forcing Joha to flee for his life. The Wise Shoemaker of Studena by Syd Lieberman. Yossi the shoemaker is renowned both for his skill at mending shoes and for his wise advice. Eager to be the first in Budapest to host the famous shoemaker, a rich merchant invites Yossi to his daughter’s wedding. But when Yossi arrives at the wedding wearing his dirty and rumpled traveling clothes, the merchant, who has never met Yossi, turns him away. Returning in borrowed finery, Yossi is immediately welcomed. At the wedding feast, Yossi plays a prank on the guests to teach that it is better to judge others by their character than by their clothes. 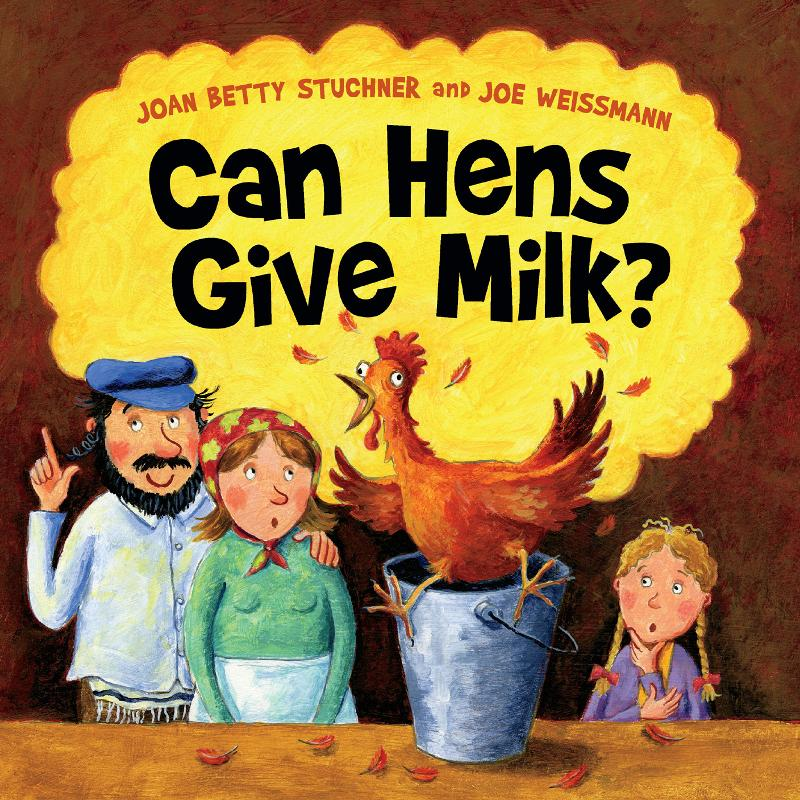 Can Hens Give Milk? by Joan Stuchner. Set in the town of Chelm, famous for its foolish inhabitants, this story is about a farming family determined to train its hens to give milk. They begin by encouraging the hens to eat grass as milking cows do. Alas, the hens show no interest in changing their diet. Frustrated, the family resorts to drastic measures.